The weather has certainly been dictating what happens in the region of late. Southampton boat show was a very wet and windy affair and numbers at the show in general were down. Carol Dutton coordinated the OCC presence on the mailasail stand at the Southampton Boat Show. Ed Wildgoose, Sue and Danny made us very welcome once again and the partnership continued to be advantageous to both sides. Topsail had invited Fi to the show to launch her second book in The Tales of Three Ships series. They had arranged with the show organisers to have Fi read the story aboard the Tall Ship Kaskelot which was fun. The only problem being that wind strength closed pontoons to children for a few days which meant they couldn’t get to the ship. Quickly they changed the venue to the main stage which meant the families were in between the customers from the adjacent Guinness Tent making an interesting mix of listeners! In the last few weeks in Menai Strait we had visits from the Bushnells on Splinter's Apprentice as well as Toodle-oo with RoRCs Bill and Laurie Balme. Cedric’s stormy visit brought a force 10 down the Strait and caused one trimaran and two lifting keel yachts to be lifted by the wind and turned over on their mooring buoys. The monohulls were both sunk but sorted at low tide when laying in shallow water and mud so are now upright and lifted ashore for repairs. Two days later with bright sun and mirror-like water it looked as though nothing had happened, except for the still upside down trimaran which nobody knows who owns - including the harbour trust to whom they should be paying mooring fees! 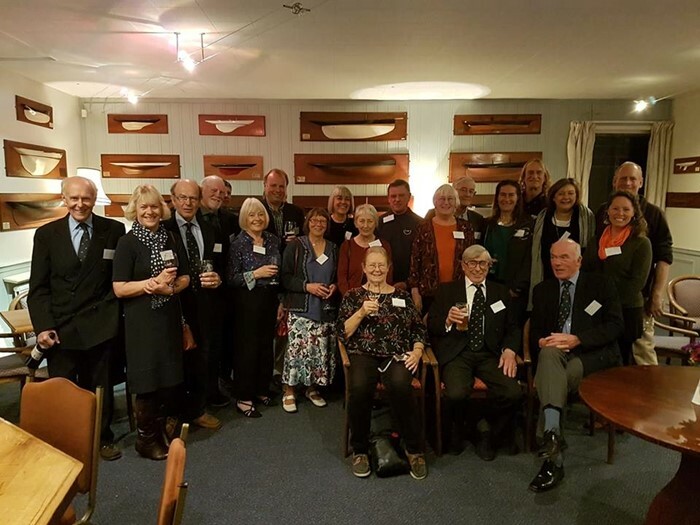 The annual OCC Scottish Dinner for 2018 was held in the Royal Northern and Clyde Yacht Club (RN&CYC), Gaerloch Road, Rhu, Helensburgh, Glasgow on Saturday 6th October and organised by Committee member Eoin Robson. The purpose of the 2018 OCC Scottish Dinner unlike its predecessors was to celebrate the 90th birthday of Founder Member and PO for the Clyde, Ian Nicolson. There were OCC members that were known to many and a few who had attended the meal for the first time. The first hour was taken up by welcoming guests and socialising in the bar. Once seated, Eoin welcomed all the guests and Commodore Anne Hammick did much the same. Anne also made it known that she will not stand for a second term as Commodore. The starters and main course were enjoyed and it appeared to the organiser that plates went back clean. OCC Past-Commodore and Archivist Bill McLaren made a speech relating to material he had in his possession concerning Ian Nicolson’s earliest letters stating his wish to start a club for ocean crossers. It became very apparent that there was a build up in progress and Bill announced Ian’s 90th birthday. The cake was produced to the tune of happy birthday and all expressed their best wishes to Ian. L to R standing: Terence Brownrigg, Amanda Marshall, Patrick Marshall, John Brown, Eoin Robson (just about! ), Rosemary Brown, John Ferguson, Eilean Yendell, Joyce Woffindin, Meg Buchanan, Graham Johnson, Avril Johnson, Iain Buchanan, Dinah Eagle (Sydney), Peter Neaves (Sydney), Jennifer Niel, Tony & Ginger Niemann (Seattle - sailed through the NW Passage and arrived Ardrossan just in time!). L to R seated: Commodore Anne Hammick, Founder Member and PO for Clyde Ian Nicolson and Past-Commodore Bill McLaren.